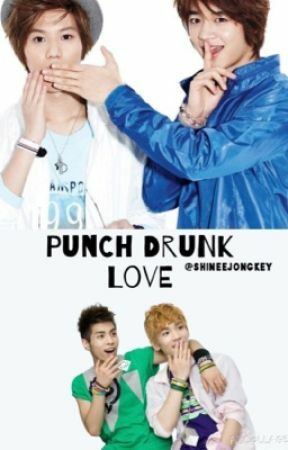 Jonghyun woke up the next morning with his arms wrapped around Key&apos;s waist. At first, he panicked - had they fallen asleep in the same bed? Had someone walked in and seen them? But then he relaxed, enjoying the moment. "Key..." Jonghyun whispered, kissing Key&apos;s shoulder trying to wake him. Key just grumbled - he wasn&apos;t good with waking up so early. "Come on, we have to get up to see the managers." The thought of getting out of bed seemed just as unappealing to him, but nevertheless, he swung his legs out of bed and stretched. "Get back into bed," Key grabbed at his arm, pulling him back down. Jonghyun laughed, rubbing the sleep from his eyes as he yawned. "We can&apos;t, Bummie," Jonghyun said, pushing the bedsheets away from Key&apos;s face. "C&apos;mon, get up!" he said after a moment of admiring Key&apos;s morning fae. "We have work to do." When Key didn&apos;t reply, Jonghyun simply grinned to himself, figuring out a way to get his attention. "Hey Key?" He smirked and Key hummed in response. "If you get up, I&apos;ll buy you fish and chips later!" He lied and Key shot up straight away, falling out of bed as a result of his eagerness. "Silly, Key," Jonghyun laughed, leaving the room with a towel slung over his shoulder, ready to take a shower. "Silly, Jonghyun," Key muttered in response once he had left the room, realising that Jonghyun was not actually going to buy him food. As much as he hated it, he gained the willpower to get out of bed. He could hear Taemin singing from down the hallway, though Onew was probably still sleeping - he always woke up last. "I&apos;m making breakfast!" Key announced as he entered the living room, still in his pajamas, waiting for Jonghyun to finish up in the bathroom so he could take a shower himself. Minho was already dressed and showered, sitting on the sofa. Taemin was on the floor next to him, tying up his shoes. "What are you doing?" Key asked, still half asleep. "We don&apos;t have to leave for another hour." Minho shrugged, clearly as puzzled as Key was. "I&apos;m taking him somewhere before we get there," Taemin grinned, glancing back at Minho who simply gave him a weary smile. "Does that mean you don&apos;t want me to make you anything to eat?" Key asked as he entered the kitchen, already sorting out the mugs for coffee. "No," Taemin called back, "we&apos;ll get something while we&apos;re out." Key heard them whispering and giggling. Key smiled to himself; he already figured there was something going on between them. But who was he to judge? The same thing was happening between him and Jonghyun. "Don&apos;t be late!" Key yelled as he heard their footsteps fade away. "Whatever!" Taemin called back as the front door clicked shut. "Taemin!" Minho called after the smaller boy who was walking a few paces ahead. "You don&apos;t have to do this, you know. I&apos;ve already forgiven you." Taemin didn&apos;t stop, he just grinned over his shoulder back at Minho who was somehow frowning and smiling at the same time. "I know, but I want to do this," he replied. He seemed pretty determined to be the best boyfriend he could, and that only made Minho love him more. "Okay, okay! Just slow down a bit!" Minho managed to catch up with Taemin, linking his arm around his boyfriend&apos;s, matching his stride. Ten minutes later, Taemin declared that they&apos;d arrived at their destination.